Clearly, one of the best things you can do to sell your house is clear the clutter and neuter it of your personal belongings. But when it comes to recouping what you've spent on other fix-up projects, what's best? 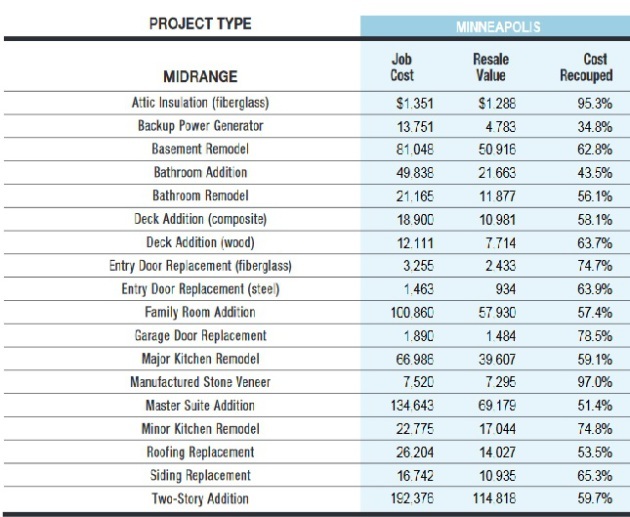 A new Cost vs. Value report from the Appraisal Institute evaluates which renovation projects will offer maximum return on investment. The report, published in Remodeling magazine, says that projects with the highest expected return on investment are attic insulation, manufactured stone veneer and garage door replacement. Other projects with higher potential payoffs are entry door replacement (steel and fiberglass) and minor kitchen remodel. (That's a national analysis, for a local take see the following charts). Appraisal Institute president Scott Robinson noted that some home improvement projects are not necessarily investments in which a homeowner should expect a dollar-for-dollar return, but rather projects that can increase the likelihood of a sale, or bring it to the same standards of other properties in a neighborhood. So keep in mind that certain projects might be essential to selling a your house, so the decision to execute might not be elective. For example, if the house doesn't have a bathroom that functions, fix it. Real estate agents say that home buyers today have been spoiled by the images of perfectly repaired and perfectly curated that appear on social media and on television, creating high expectations for the condition, finishes and amenities of the houses they're considering. Many buyers today are also busy and don't have the time to tackle a fix-up project. On the flip side, it's entirely possible to over-improve your house by adding things that you might consider an amenity, but that won't necessarily be valued by many buyers. That includes special-use spaces like saunas and wine rooms, and amenities like swimming pools and tennis courts. He also warns homeowners to hold off on big, expensive renovations if they’re unsure how long they will be in their home because the longer you own a property, the greater the opportunity for a return on investment. The top projects for the Twin Cities are slightly different than those that offer the best return nationally, but the studies were all based on that same paramaters. For example, an attic insulation (fiberglass) project includes sealing all air leaks in a 35- by 30-foot unconditioned attic and filling with loose-fill fiberglass insulation, bringing it to a R-30 insulation value. The generator specs include a modular propane gas-powered electrical backup system with capacity for providing 70 amps of emergency power in two 240-volt circuits and six 120-volt circuits. And the basement redo is based on a 20-by-30-foot entertaining area with wet bar, a 5-by-8-foot full bathroom with vinyl floors and a two-piece fiberglass shower unit and a 24-foot partition wall to enclose the mechanical area.